SKULL KINGDOM DATES: Alas, no more! 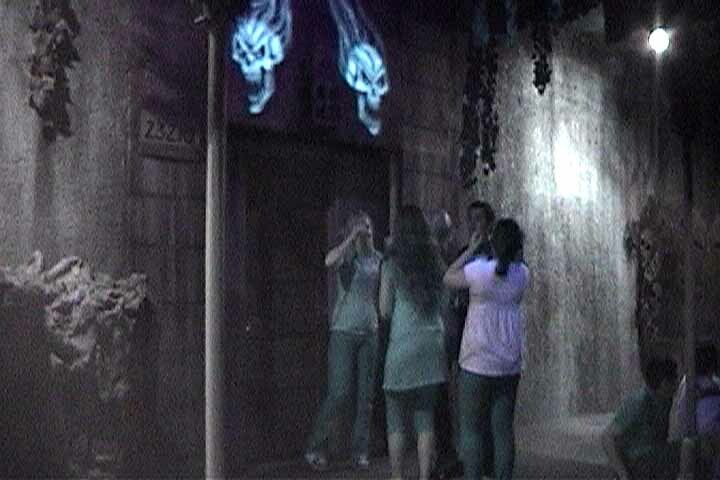 After making its debut in 2008, this Halloween event - part of the Spooky House chain of Halloween Haunts in Los Angeles - closed down after the death of owner Bob Koritzke in 2009. Behind the forbidding castle walls of Skull Kingdom, you’ll find a haunting collection of goblins, ghosts and monsters – all of which are trained to make your every nightmare come true. Dark hallways and haunted chambers are all a part of the fun inside. All ages are invited to witness a frightful day or night of entertainment inside. Skull Kingdom offers toned down and less scary shows for all ages, as well as an extra scary night show for older kids and adults only. SKULL KINGDOM 2008 ADDITIONAL INFORMATION: The haunt location is next to an outdoor October fest, featuring family-friendly fun like pumpking carving for kids too young to endure the horrors of the haunted house. For some reason, the area is occupied by a herd of life-sized animatronic dinosaurs. These are truly impressive, with excellent detailing, including great skin texture and coloring - totally cool and a little bit scary but not exactly "Halloween" in nature. At least these "terrible lizards" are fearsome enough to work as a sideshow attraction during the scary season, and best of all - viewing them is free. Check out our archive for of Skull Kingdom.